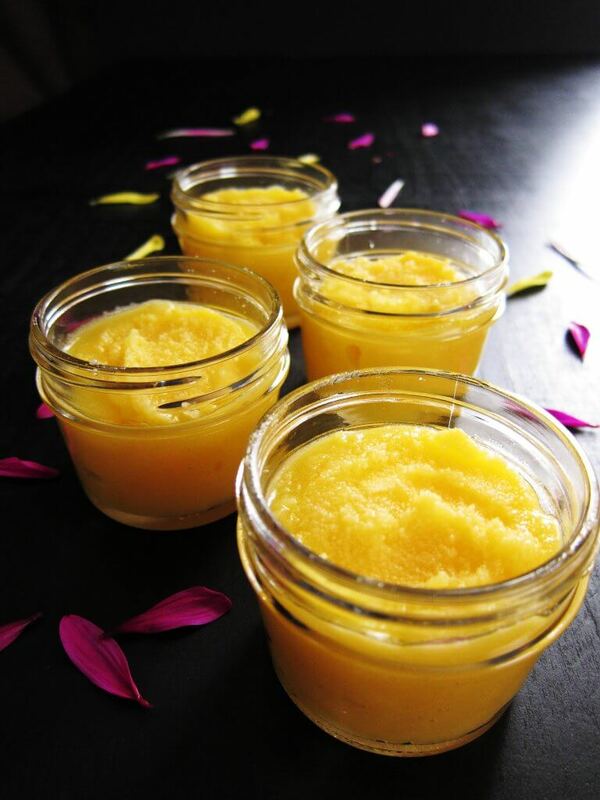 Enjoy the health and nutritional benefits of ghee with this Homemade Instant Pot Ghee recipe, perfect every time. It seems that the world has discovered ghee, something that Indians have used for thousands of years for everyday cooking, medicinal purposes, and religious ceremonies. I never imagined there would be a day when ghee would become a staple in western kitchens, and I think that’s terrific! I’m going to show you how to make homemade Instant Pot Ghee, so you never have to buy it in the store again. It can get quite expensive buying good quality ghee! You may be asking “what is ghee?” Ghee is essentially clarified butter. This means that butter is heated, melted and removed of all milk solids and impurities. Unlike regular clarified butter, ghee is cooked for a bit longer, to the point that the milk solids have a caramelized color. What’s remaining has an intense flavor, aroma, and color. Ghee has a high smoke point, much higher than butter, and that means it can be heated to high temperatures. It also tastes great unheated, used in place of butter. Ghee doesn’t spoil at room temperature like butter can. And it has many health benefits: it’s lactose-free, is rich in vitamins, is good for digestion and has antioxidant properties. I used to use a slow cooker ghee recipe to make ghee in my Crock Pot and it came out great. But using the Instant Pot to make ghee takes less time and I get more consistent results. My Instant Pot Ghee recipe is simple and easy, but not “instant”! You’ll need a couple of hours, of which hands-on time is about 10 minutes. And no, it’s not a typo – you set the Instant Pot on slow cook with the lid off so condensation doesn’t drip back into the butter. It’s fine to keep the lid on during the slow cook stage, but you’ll have some splatter in the second stage of cooking (‘Saute’). I recommend that you get a splatter screen to protect your countertop and floor in case the melted butter bubbles up. This can happen during the slow cook phase and the saute phase. You’ll also need a fine mesh strainer to strain the ghee from the milk solids. You’ll also need a large mason jar or a few smaller jars. I use butter made from grass-fed cows. I like to use Kerry Gold or Trader Joe’s butter for making ghee. Although they are more expensive, since it’s good quality grass-fed ghee, I justify the cost! I also find that there’s less foaming with the grass-fed butters. 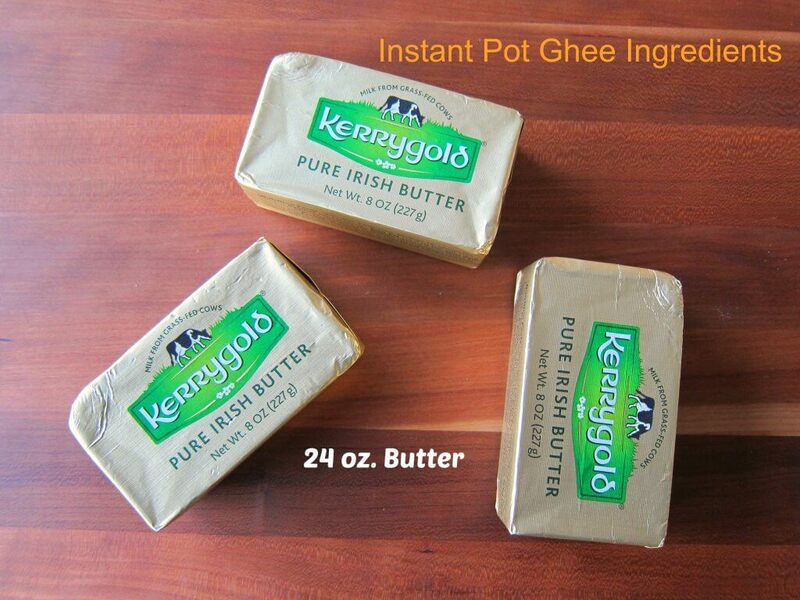 The color of Kerrygold butter gives the ghee a wonderful golden color, as you see in my photographs. The choice of butter is entirely up to you; use what you like. If you’re new to the Instant Pot and aren’t familiar with how to use it, please read the Instant Pot DUO Beginner’s Quick Start Guide or the Instant Pot ULTRA Beginner’s Quick Start Guide first and then come back here to learn how to make this Instant Pot Ghee. Place sticks of butter in Instant Pot. The timer will count down to 0:00. After 2 hours, the timer will beep. Press ‘Cancel’. * If you wish to cover the Instant Pot during this stage, then during the next stage of cooking (saute mode), you may have some bubbling and splatter due to condensation, so be sure to cover the Instant Pot with a splatter screen till the bubbling slows down. ** It’s possible that your butter may bubble up initially, while it’s melting. A splatter screen is really handy to make sure you don’t have butter splatter on your countertop. The milk solids will have settled to the bottom and will still be pale yellow in color. Press ‘Saute’ and press ‘Adjust’ to set temperature to ‘Normal’. Cover the pot with a splatter screen, because there may be some bubbling and splatter. Saute for 9 to 10 minutes, stirring often till the milk solids turn to a golden color. Be careful to keep your face away from the Instant Pot in case the ghee bubbles up. Turn off Instant Pot and let the ghee cool down. The milk solids will darken to a caramel color in the residual heat. If the milk solids start to darken too much, remove the inner pot from the Instant Pot. If the milk solids are too light, the ghee will spoil quicker. Make sure the milk solids are a golden yellow color. When they cool down in the residual heat of the Instant Pot they will become a caramel color. 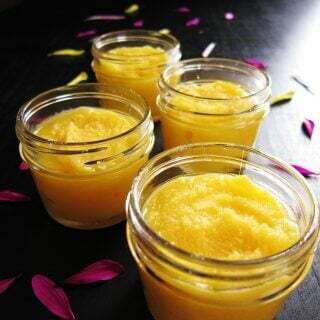 Allow ghee to cool completely. Strain the ghee through a fine mesh strainer into mason jars. Store in a cabinet away from sunlight. Ghee will last for months at room temperature because all the milk solids have been removed. Storing in the refrigerator will make it last even longer. 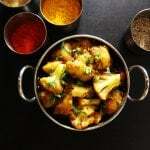 Use Instant Pot ghee in place of butter or oil in your everyday cooking, as in this Instant Pot Chicken Curry or try spreading it on a slice of toast or a baked treat. Mmmm-good! Enjoy the health and nutritional benefits of homemade ghee with this Homemade Instant Pot Ghee recipe, perfect every time. Cook in 'Slow Cook' mode for 2 hours at 'Normal' temperature. Use a splatter screen if necessary. The milk solids will have settled to the bottom and will still be pale yellow in color. Turn off Instant Pot. Turn off Instant Pot and let the ghee cool down. The milk solids will darken to a caramel color in the residual heat. If necessary, remove the inner pot from the Instant Pot and place on a heatproof surface. Strain the ghee through a fine mesh strainer into mason jars or glass bottles that can be closed tightly. * If the butter starts bubbling up during the melting phase while in 'slow cook' mode or during the 'saute' mode, use a splatter screen to keep your countertops from becoming messy. 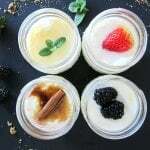 See the blog post for more detailed recipe tips, and see the step-by-step instructions and photographs for details on what color the milk solids should be. I grew up with ghee and make it on the stove. I never thought of making it in an Instant Pot. Thanks for the clear instructions. Never going back to the stove version! You’re so welcome. I love that you don’t have to watch it every minute except for the last 10 minutes. 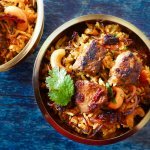 Instead of slow cooking for 2 hours and then saute for 10 minutes, is it possible to slow cook for 2.5 or 3 hours? Hi there, I’m sure you can do it entirely on slow cook mode, but I’m not sure that time will be enough. You might try it out and just keep an eye on it for the solids to become caramel colored. If you find that it’s taking too long, just short-cut and turn on saute mode. You might also try it on ‘More’ rather than ‘Normal’ slow cooker temperature setting. Do let us know how it goes if you try it out. I’m sure others, including me, would love to know! Does it matter if the butter is salted or not? Teresa, You should be fine. Usually the salt gets strained out with the solids. Make sure you use a fine mesh strainer. Can you use the milk solids for anything? Do you have to use Kerry Gold butter or can you use any butter in the food store. Not margarine right? Donna – thanks for your question. You can use any butter, I do that sometimes. Find one that expires the latest. Land O Lakes works fine as do the Sam’s club and Costco brands. Hi! 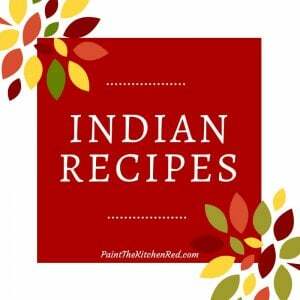 Can you tell me how much ghee this recipe makes? Hi Cindy – it makes about 2 cups of ghee. Cindy – you could use salted butter. A lot of the salt is left over in the milk solids but the ghee will have a light salt taste. Or you can add salt after straining and before it solidifies. Hi Cindy – as long as they’re not burnt or too brown, you can add them to curries, rice, mashed potatoes, pasta, risotto, veggies. We make Indian sweets with the milk solids too! Sue – I use the middle setting (normal). Thanks for your question. I followed all directions and my butter color is brown not golden. It taste good, like brown butter and not burnt. I think it went past the Ghee stage. I was wanting all the milk fat solids out of my butter, but brown butter has all the milk fat solids, correct? I hate to waste this butter, but I donl’t want all the fat. Marie, did you use Kerrygold butter? I get that golden color with that brand. When I buy regular butter, it still works but the color isn’t the same – more light brown. If it’s not burned, and you actually had milk solids left over, I think you should be fine to use it. I have used this over and over with success. I like to do a pot roast with the solids in the same pot! at the sauté point because they get brown quickly. I like to put coconut oil with mine at the end 1:1. Thank you Jill, for sharing! I’ve never heard of mixing coconut oil and ghee before. This recipe is AWESOME and so EASY!! My child was recently diagnosed with Chrons and I am lactose intolerant. Only since his diagnosis have I found ghee, but it’s just so expensive! So this recipe is a game changer for us! I can purchase the grass-fed butter and make this recipe at home for about half the cost of buying ghee in the store. The first batch I made ended up brown butter, but I’ll use that for some holiday baking. My subsequent batches have easily produce gorgeous, wonderful the!! Thank you so very much!! Hi Penny – yes, it’s a fine line between brown butter and ghee. I think the first time most people think it’s not the right color, and keep cooking not realizing that it will darken. Thank you for your lovely comment, and good wishes to your child in their fight against Chrons. Hi there! I was wondering how long the shelf life usually is for this? Thanks! I usually finish what I make within a couple of months and it’s fine. You can tell if it goes bad, because it’ll smell rancid. Can you freeze ghee? I live alone and I think I would have a hard time using 2 cups of ghee on my own. Thanks! Yes, Robyn, you should be able to freeze it. If there’s any sediment, it would probably settle to the bottom and you might need to filter it. If the ghee separates, just stir it up. Used this recipe/method in my IP to make my first batch of ghee yesterday. Turned out great! I used Kerry Gold unsalted butter. I’m on the Whole30 diet right now, and ghee is a recommended fat to consume. Can’t wait to cook with it. Thanks for posting this method of making ghee, certainly will save money and be fresher! Me too! I just created a video for the recipe and in the process got myself a batch of ghee 🙂 This time I used salted butter. Both work great. But Kerrygold all the way! Gina, yes you should be able to double the recipe just fine.